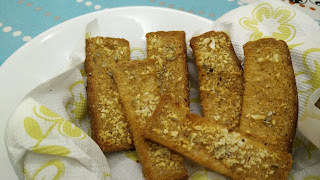 Garlic bread is simple, easy, quick snack recipe with less ingredients. Make garlic bread in airfryer and enjoy crisp, hot garlic bread at home. Homemade garlic bread is much healthier than market ones. 1. Cut bread slices into desired shape. 2. Take Amul butter and mix garlic well. In case of unsalted butter, add little salt to it. 3. Apply butter and garlic mixture liberally onto bread slices. 4. Preheat airfryer and put all pcs in airfryer basket. Airfryer garlic bread at 180 degrees for 3 minutes. Alternatively, garlic bread can be baked in oven, or in microwave or even on tawa. Thanks for sharing this amazing recipe with the Philips Air Fryer.